Here's the moment when spec advertising finally digests its own tail. The Open Collaboration (aka, OpenCo), a South African agency majority owned by TBWA, whipped up what it apparently considers a masterpiece of social-cause messaging—a print ad showing side-by-side photos of Hitler and Mandela in prison. Hitler served nine months, the copy explains, while Mandela served 27 years. "People do not always get the justice they deserve," says the copy below. "We're doing everything we can to change that." As you can see, there is a blank space where the logo should go. That's because it's a spec ad, done without client approval—indeed, without a specific client in mind here. But OpenCo hoped some group devoted to righting unnamed injustices in the world would, after initially fainting at the ad's brilliance, slap its logo on there. That didn't happen. So OpenCo, feeling offended, decided to do something even more solipsistic than regular spec work. It went and made another ad about the first ad, describing it in detail—to call attention to the fresh injustice of having the spec ad ignored, and to hopefully get it in front of someone "brave enough to run it." There's so much that's odd about this, even if you accept that it's not just a cynical PR play (though the whole "This is not a print ad" thing does seem aimed at ad people). First of all, the creative is provocative—it would be offensive to many—and might not align at all with any organization's marketing needs. 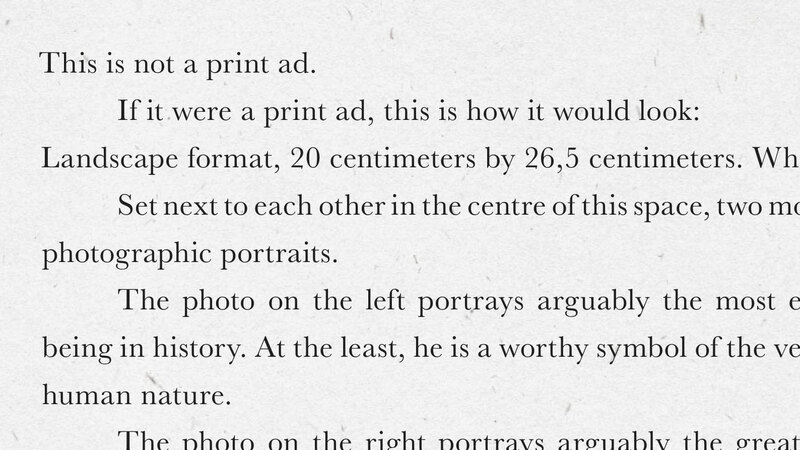 Not many people, after all, are that fond of using Hitler in their ads. The bigger issue, though, is the arrogance. This is spec work. Getting indignant when no one buys it makes you look like a fool. And in this case, it's worse than that. OpenCo isn't just complaining about intransigent would-be clients rejecting its work. It's flat-out calling them cowards. That's a pretty rich point of view for an ad agency to take of nonprofits doing real social work. Let's assume this stunt was well meaning. (We emailed OpenCo on Wednesday, but still haven't heard back.) Maybe next time, if they really want to fight injustice in the world, they can start by not publicly shaming organizations that do so every day. We can understand that it might feel like a PR stunt to you, but our intent to put the idea to use is genuine. As a result we found your interpretation of our intention to be a little distressing. We are not "angry" or "offended" that no one has run the ad, we are hopeful that we will find a client for it, despite not having any takers so far. As an agency, ideas are what we have to offer, and we wanted to offer this one to a client who sees value in it. We don't presume that the ad we'd like to make is objectively "great." What we do know is that the juxtaposition of the images creates a visceral reaction in people who see it. For better or worse, it cannot be ignored, and ideas like this are relatively rare. We respect all reactions to it. That some would find it offensive was clear to us. We don't believe that this is reason enough to subvert it. The hope is that the text-only description will attract publicity so that the ad might find a home—it's obviously the kind of idea that will be embraced only by a very particular kind of client. We're hoping that by spreading the net, we can either find this client or discover that no such client exists. If the idea can be useful to an appropriate party, then we'd like them to use it for free. Just to clarify, we don't expect that a client would just slap their logo on it. We would want to work with an interested party to make sure that the messaging and idea serves their specific communications needs. Slightly different iterations of this idea have been presented to more than five different parties over the course of a few years going back to about 2011. We are hesitant to name them as the intention is not to shame them. Most of them really liked the ad and its message and expressed a genuine interest in running it, but backed out in the end. They all had perfectly good reasons for not running it—we are aware that it is not an easy ad to back and certainly don't judge them for their decisions that are rooted in strategies and contexts that we don't presume to fully understand. When you say "brave enough," we say that a client would have to be brave to run this kind of idea because of its potential to attract attention, to offend and polarize. There will be publicity that comes with the ad—many of these organizations don't feel that they have the media liaison capacity to manage the publicity an ad like this could create, even with the help of the agency. That said, we truly believe the attention can be used to create positive action. This does not mean we are questioning the courage of the approached organizations with respect to the work they do. The organizations we've contacted so far include well-known international human rights and social justice advocates, South African pro bono legal service groups and groups that advocate for awaiting trial and wrongfully accused prisoners through journalism. We have approval for the potential use of the Mandela image in an ad that juxtaposes it with the Hitler image—this approval comes from the Nelson Mandela Foundation which represents his legacy and personality rights on behalf of his family amongst other stakeholders. We also have permission from the photographer, Jurgen Schadeberg, to use it in an ad like the one described. The idea to run the long copy description is one that only arose in the last couple of months. It came about after another experience where a client was initially interested but later backed out. It was an experiment in response to our curiosity about whether there is any client out there who would be willing to follow through on this provocative idea. To date, the text-only ad has been published in the North Eastern Tribune, a regional Gauteng paper. We are negotiating to have it published in the Mail & Guardian, a national newspaper with a strong readership amongst our target market—we're trying to get the best price as the agency is not a big one and has a limited budget for this. Of course, a great way to amplify the reach of the ad is to put the published piece online where it can travel without attracting onerous media costs. This makes sense on another level – to a large degree we feel that we have exhausted our local options by approaching relevant South African clients the traditional way. We feel that if there is a client who is interested, they may be abroad. It's more realistic to reach them online than by publishing in papers around the world at a cost the agency couldn't really afford.